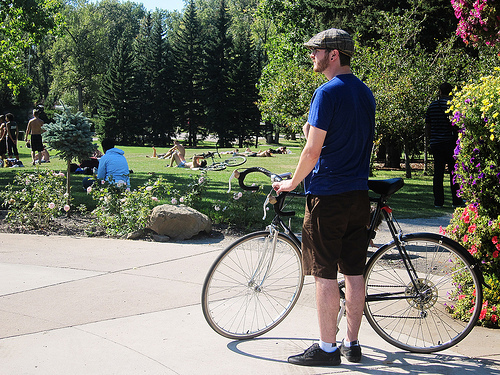 Bikes, Prince's Island Park, and theatre all go so nicely together! A Calgary summer tradition is returning to Prince’s Island Park. After a brief hiatus in 2011, Mount Royal University’s Shakespeare in the Park will be performing A Midsummer Night’s Dream. In partnership with Theatre Calgary, Shakespeare in the Park will be celebrating its 25th season with a top-notch cast and crew, including students from Mount Royal’s Theatre Arts diploma program and post-secondary graduates from across the province, along with Theatre Calgary professionals. This year, the director will be Michael Shamata, the artistic director of Victoria’s Belfry Theatre, who is renowned for his outdoor productions of the Bard in Canada. We will meet at Central Park (on the corner of 12 Ave and 4 St SW) at 6 pm and then get going and take a leisurely ride to Prince's Island Park starting at 6:30 pm. The show starts at 7 pm. Admission: pay what you can. A Midsummer Night’s Dream is suitable for all ages. Bring snacks/pic-nic if you want since it is over dinner time. Oh and by the way, the actors will all be riding bikes in the show! Hope to see you at the Island! !